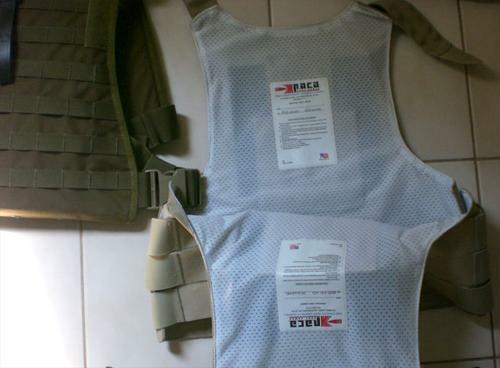 A very hard to find PACA LowVis Body Armor (tan color) with MBSS Plate Carrier. Real deal PACA Low Visibility armor carrier for the BALCS, SPEARS, MBSS or CIRAS cut soft armor panels. These concealable carriers are designed to carry the PACA IIIA SPR soft armor panels (for Eagle CIRAS). They will also accept SPEAR/BALCS cut soft armor panels. They are adjustable at the shoulders and at each side opening to give a wide variety of fitting options. Each side opening has three individual elastic straps for adjustments. These Low-Vis SPR Carriers have the added feature of an internal rifle plate suspension system. The front and rear sections will accept the corresponding SAPI sized plates. It\'s more common for a Navy SEAL these days to wear a plate carrier w/ PACA LowVis.